Books that are out on loan can be reserved in a few quick steps using the Library’s search tool, Hunter. If you haven’t already, sign in to Hunter. When a copy of the book becomes available you’ll receive an email, and will then have one week to collect it from the Library Helpdesk. Library staff have been busy searching Hunter this week to find some scientific (and not-so-scientific) festive reading for you, all in the name of spreading some good cheer. Have a look at our highlights below – we’ve linked to the Hunter record or full-text where possible. Carpenter, G. et al. (2018) ‘Wine astringency reduces flavour intensity of Brussels sprouts’. To be published in Journal of Texture Studies [Preprint]. Available at: https://onlinelibrary.wiley.com/doi/full/10.1111/jtxs.12378 (Accessed: 18 December 2018). Gether, L., Gyldenløve, M. and Thyssen, J.P. (2017) ‘Christmas tree dermatitis caused by colophonium allergy’, Contact Dermatitis, 77(6), pp. 412-414. Available at: https://onlinelibrary.wiley.com/doi/full/10.1111/cod.12798 (Accessed: 18 December 2018). Ince, C. et al. (2012) ‘Why Rudolph’s nose is red: observational study’, BMJ, 345:e8311, pp. 1-6. Available at: https://www.bmj.com/content/bmj/345/bmj.e8311.full.pdf (Accessed: 18 December 2018). Park, J.J. et al. (2016) ‘Dispelling the nice or naughty myth: retrospective observational study of Santa Claus’, BMJ, 355:i6355, pp. 1-5. Available at: https://www.bmj.com/content/bmj/355/bmj.i6355.full.pdf (Accessed: 18 December 2018). Straube, S. and Fan, X. (2015) ‘The occupational health of Santa Claus’, Journal of Occupational Health and Toxicology, 10(44), pp. 1-3. 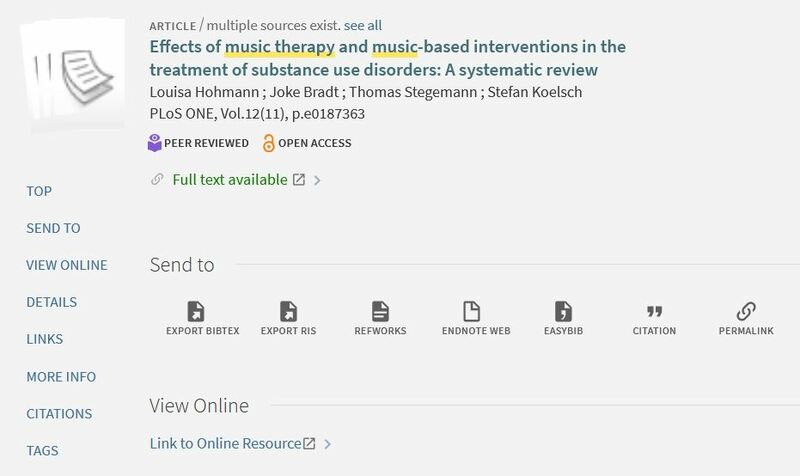 Available: https://occup-med.biomedcentral.com/articles/10.1186/s12995-015-0086-1 (Accessed: 18 December 2018). Wormser, G.P. and Ladenheim, A. (2018) ‘How many calories did Santa Claus consume on Christmas Eve?’, Wiener klinische Wochenschrift, 130(1-2), pp. 73-75. Available at: https://link.springer.com/article/10.1007%2Fs00508-017-1306-8 (Accessed: 18 December 2018). Whether you’re back in Tooting or still a little further afield, the Library has a range of help and resources that you can connect to from (almost) anywhere, helping you get a headstart on your studies for the new semester. Use the new-look Hunter to search for e-books and online journal articles that you can access from anywhere with an internet connection. To find e-books, drop down to ‘Books and more’ before you search, then use the filter options to narrow your results to Online Resources. Search in ‘Articles and more’ to find online journal articles and similar material. To open the full e-book or article, follow the links under ‘View Online’ and enter your SGUL login and password. You can find more help in our PDF guide to accessing e-resources from offsite. For more advice about finding resources in Hunter, see the Hunter FAQs. More online resources, including Acland’s Video Atlas of Human Anatomy, BMJ Best Practice and DynaMed Plus, can be found in the Databases A-Z. Find more information about online resources and apps in the Useful Apps section of our Library Essentials LibGuide. Use this link to reset it from offsite. Note: you must have already set up an external email address and if you don’t receive a reset email, check your junk mail folder. The Library remains open 7 days a week, with 24 hour opening returning from Monday 17th September. The Library Helpdesk is staffed as usual from 8am to 6pm every weekday. Call in and see us, or phone us on 020 8725 5466. The Research Enquiries Desk can help with more in-depth queries about finding resources, referencing and more. Drop in or phone 020 8725 5514 during the RED’s staffed hours (see below). Alternatively, email a query to liaison@sgul.ac.uk and a liaison librarian will get back to you. Find more information about these and other services – including support with IT and academic writing – in the Getting help section of our Library Essentials LibGuide. Hunter has had a makeover for the new term. While the search tool’s features remain the same, it has a fresh new look which will change the way you use and navigate Hunter. Read this blog post for a quick guide to some of the cosmetic changes that have been made to Hunter’s interface, or see our Hunter FAQs for further guidance. Hunter’s new homepage has a clean design with a search bar for all of our resources embedded in the centre of the page. The homepage header provides links to your account, interlibrary loans, databases and more. You can sign in on the top right hand corner for full functionality. You’ll find links to our social media accounts and library blog along the bottom of the page. You can like or follow our accounts to keep up-to-date with the library. Hunter’s search ‘widget’ has had a facelift and is now a deep blue instead of orange – you will find this embedded on the Library website and in our LibGuides. It will continue to perform the same search functions as before. You are still encouraged to select the category that you would like to search from the drop down list. You should then type in some keywords from your search topic and select ‘Search’ to view your search results. Loans: This tab will show you a list of items you currently have on loan and their due dates. You can also change the drop-down arrow to view your previous borrowing history. Requests: This tab will highlight any items on which you have placed a hold. Click this tab to check your place in the queue, or cancel your request if you no longer need the book. 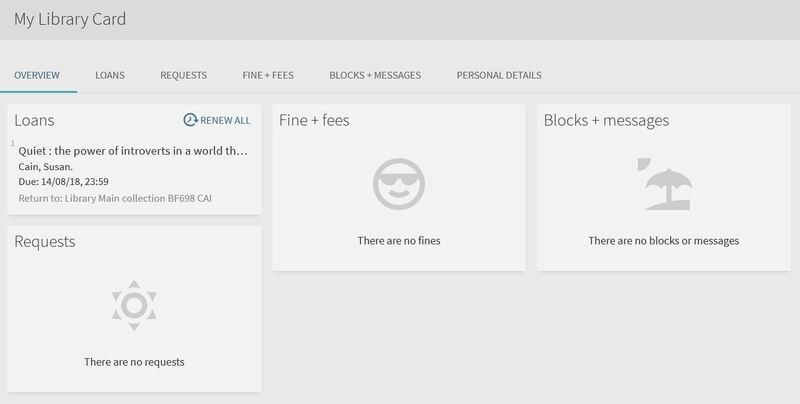 Fine + Fees: This tab will include the details of any fines or fees associated with your record. These might include fines for overdue items, or invoice and administration fees for lost or damaged books. Your eShelf will remain active and any items that you have previously added will automatically be transferred over to the new Hunter interface. The eShelf has a new icon, the pin graphic, which you can select to add items you want to save. The pin icon in the top right hand side of the page will take you to your eShelf. The different tabs within your eShelf will allow you to view your save records as well as any previous searches you have saved. If you have lost track of your searches in a particular browsing session, you can view your search history for a reminder. More detailed guidance on adding, managing and removing items/searches from your eShelf will be published shortly. It’s now easier than ever to reserve a book that’s out on loan using the Library’s search tool, Hunter. Hunter confirms that your hold is placed.